(Photo: © Peter Kenny / Ecumenical News)Worshipers at the Church of the Holy Sepulcher in Jerusalem on Feb. 14, 2016. 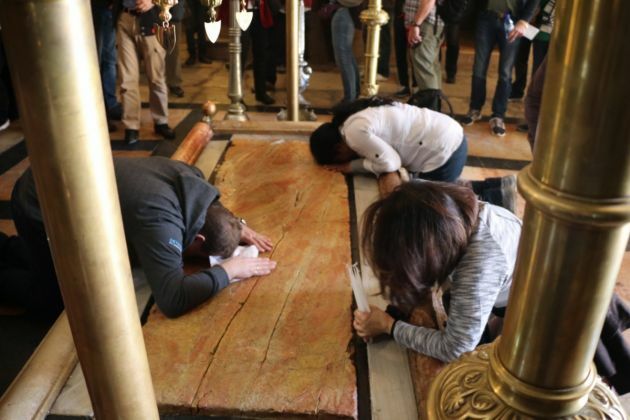 Thousands of tourists and clergy members from across the globe have gathered at the Christian quarter of Jerusalem's Old City to view the recently restored Church of the Holy Sepulcher, where Jesus's tomb is located. The renovation work is believed to have cost $3.5 million renovation and the Greek Orthodox, Armenian and Roman Catholic churches custody of the important holy site in Israel. The money was raised by the representatives of the three churches administering the site, including H.B. Theophilos III, the Greek Orthodox Patriarch, Fr. Francesco Patton, the Custos of the Holy Land, and H.B. Nourhan Manougian, the Armenian Apostolic Patriarch. The last time the church was restored was in 1810. "For the first time in over two centuries, this sacred edicule has been restored," said Greek Orthodox Patriarch Theophilos III of Jerusalem. "This is not only a gift to our Holy Land, but to the whole world." The tomb, which is part of the Church of the Holy Sepulcher in Jerusalem, is a major pilgrimage site where millions of Christians pay homage every year. The renovation has restored the tomb after it was left discoloured by soot due to centuries of candle smoke and pilgrim visits, The Daily Express reported. It said religious worshippers were amazed by the newly restored red marble of the structure surrounding the burial place, known as the Edicule. Papal Nuncio Archbishop Giuseppe Lazzarotto was present at the renovation completion ceremony next to the Edicule surrounding the Tomb of Jesus at the church. Greek Prime Minister Alexis Tsipras and the Greek Orthodox Patriarch of Jerusalem Theophilos were at the Edicule following a ceremony at the Church of the Holy Sepulcher. The Orthodox Patriarch of Constantinople Bartholomew I, who many considered to be the spiritual head of Orthodox believers, also spoke during the historic ceremony. The Greek Orthodox, Armenian and Roman Catholic denominations share custody of the important holy site in Jerusalem's Old City in Israel.